Experience this full day tour to Mt. Fuji's 5th Station and Lake Kawaguchi. After arriving at the Mode Gakuen Cocoon Tower, you will get situated in your air-conditioned coach and meet your guide, before departing at 8am to Mt. Fuji, about a 2 hour drive. Included on this tour, you will see Mt. Fuji 5th Station, Kawaguchi Lakeside, Oshino Hakkai and even have the opportunity to shop at the Gotemba Premium Outlets! Lunch will be provided at the Kawaguchi Lakeside restaurant with Yamanashi Prefecture's popular "Houtou Udon Noodles" meal set. If the weather is good enough, you can overlook Mt. Fuji while having lunch in the restaurant. After an amazing day on the mountain, you will then be taken to the Gotemba Premium Outlets to shop before departing back to Tokyo. This tour will depart from Shinjuku at around 8am. Traveling for about 2 hour by the tour bus and passing through the Fuji Subaru Line, you will reach the first destination Mt. Fuji 5th Station for sightseeing. It is most popular station among foreign travelers due to its beautiful scenery and good atmosphere. Even if you are not a mountain climber, you can still be here in person and experience the fresh air and the nice view! You will be able to visit the Mt. Fuji Komitake Shrine here as well if you have time. Continuing with the tour, the next destination will be the Kawaguchi Lakeside, which the restaurant for lunch is located here. You will enjoy your traditional Japanese style "Houtou Udon Noodles" meal set and take a break here for about 60 minutes. After, you will get ready for the next destination, sightseeing at the Oshino Hakkai. It is a group of springs located in Oshino Village, Yamanashi Prefecture. Snow that melted from Mt. Fuji, is filtered between underground lava, over the course of about 20 years and it creates 8 springs. By going through such a natural process, it created one of the most clearest water in Japan, with the average water temperature of 13 degrees celcius, the water is very freshening. Thus this area is a precious natural treasure in Japan. For the final stop on the tour, you to do some shopping at Gotemba Premium Outlets! It is one of the largest outlets in Japan. There are over 200 shops including popular Japanese brands as well as luxurious international designer's brands. In addition, it is near to Mt. 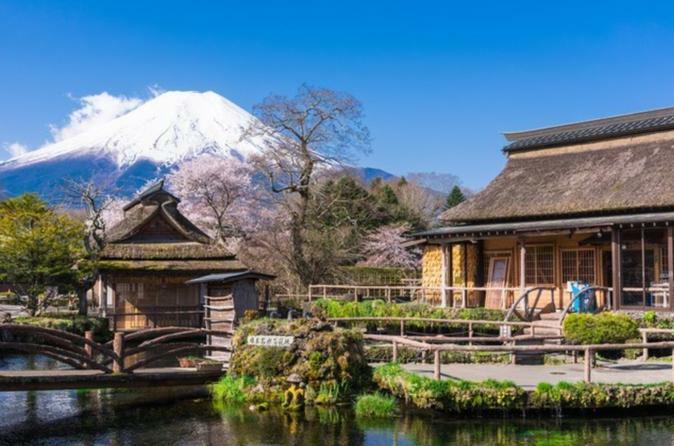 Fuji, Hakone and other resort areas so that you are able to enjoy the nature while shopping. Your bus will return to Shinjuku and arrive at around 6:30pm, concluding the tour.